"...I've noted before that artists like Lennix, who are making their living in films and on television shows over which they have limited control, often choose plays in the theater that offer up the very challenges and fulfillment typically missing from their mainstream careers. That feels like what is going on here. Lennix is working in, and telling a story about, Chicago. And thus there is — if you can stomach the pain — something important to see deep in the bowels of the Athenaeum on the North Side. Stomach it you should; it's the same agony as on the news." "...Dalcoe has nothing particularly new to say about any of this, but it is the mythic, poetic, hallucinatory method she employs to tell her story that makes the difference, and Lennix and his cast give themselves over to it with total commitment. No surprise that we hear a riff from "Strange Fruit," the haunting song about lynching that was written in 1939 by Abel Meeropol and made famous by Billie Holiday, nor that the centerpiece of Andrei Onegin's chilling fairy tale-like set (stunningly lit by Richard Norwood) is an oak tree that signifies every lynching that took place in this country from the 19th century on into the 1960s." "...The old ghosts of the south come alive in this beautifully audacious tragedy by Lekethia Dalcoe. Directed by Harry Lennix (The Blacklist, Chi-Raq), this true tale of Mary Turner (Tiffany Addison)-a young woman eight months pregnant who was lynched in 1918 after denouncing the similar murder of her husband-is told through fearless, emotionally bare performances, ethereal language, heartbreaking melodies, and the sheer brazen truth." "...As I heard descriptions of historical lynchings while immersed in a design that’s meant to put the audience in the place of the victim, I remembered having felt cold and light-headed during a performance of Parade and I wonder if Congo Square’s African-American regulars might have a similar experience at this far more brutal show, despite its redemptive message. 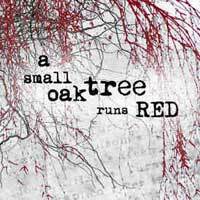 A Small Oak Tree Runs Red’s disturbing imagery makes it very much not for everyone, but it is transformative, and serves an important purpose in reminding us of the events that shaped our country." "...Punctuated by scenes of straightforward drama, the rest of the play is a surreal discovery of injustice, disembodied shouts and, again, pain. The actors are powerful. Fenner manifests rage with spit and fire, while Addison holds your hand as best she can. And Conner does some work that will make your skin crawl and your heart ache." "...This is our country's history; it must be known, acknowledged, and accepted; and thanks to Dalcoe, Lennix, and the superb efforts of Addison, Conner, Fenner, and the Congo Square team, no attendee of "Small Oak Tree" will leave the theater forgetting that."